Sometimes the best things come in small packages, such as this Hi-Relief Skull Micro Morale Patch by Maxpedition. This patch measures less than an inch in diameter, making it a perfect small statement piece to be worn on a sleeve, hat or other accessories. It attaches quickly to the loop lining of Maxpedition bags, but it can be added to any bag employing the additional loop fabric, or sewing the patch permanently and directly onto fabric materials. The original skull design is exclusive to Maxpedition. 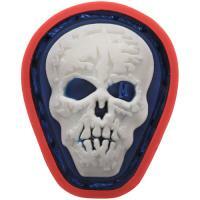 Take pride in knowing the skull patch will retain its bold coloring with a quick soap and water cleanup.